Detective Christopher Lima speaks with 27 year old Colt Hogan at the Relax Inn in Livingston. Marijuana and Meth, Two Busted at Local Inn, LIVINGSTON, October 30, 2013 - Shortly after 9am on October 29, 2013 Lieutenant Andy Lowrie with the Polk County Sheriff's Office Narcotics Division and other officers closed in and executed the arrests of two people at the Relax Inn in Livingston. Lowrie was joined by Detective Christopher Lima and Deputy Mike Nettles as they seized marijuana, methamphetamine, and drug paraphernalia. 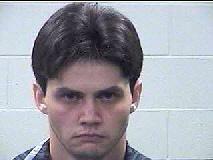 Arrested were Colt Kahle Hogan, 28, of Clarion, Pennsylvania and Lauina Marie Emerson, 21, of Onalaska. The two were staying in room number 25 at the small establishment. Methamphetamine, a bag of marijuana, and glass pipes and other paraphernalia were confiscated. Colt Hogan was charged with possession of a controlled substance (felony) and possession of marijuana. 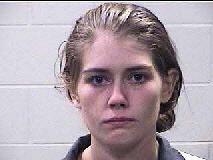 Lauina Emerson was charged wit possession of a controlled substance (felony). Both were cuffed and taken to Polk County Jail and booked in. Their vehicle was towed from the scene by Ken's Towing and will be stored at Harrison Body Shop in Livingston. The arrests were the result of an investigation by the Polk County Sheriff's Office Narcotics Division. 21 year old Lauina Emerson of Onalaska stands by in cuffs. In addition to methamphetamine, detectives found a generous portion of marijuana. Deputy Mike Nettles escorted Hogan to a Unit to be taken to the big house. Emerson was also taken to jail. Both Hogan and Emerson are facing felony charges. Detective Lima bags confiscated evidence.